For the quest, see Angarvunde (quest). Angarvunde is a medium-sized Nordic tomb at the foot of the mountains directly west of Riften and slightly northwest of Avanchnzel. There are a total of three internal zones: Angarvunde, Angarvunde Ruins and Angarvunde Catacombs. The two side zones are linear in nature and loop you back to the main chamber in Angarvunde where the entrances to these zones are found. The northwestern zone, Angarvunde Ruins, has two loops. The path leading from the road to the entrance is the natural habitat for several leveled animals. The entrance is little more than a tunnel leading into a cave and is marked by broken arches and fallen masonry. Outside of the entrance is a campsite, complete with a cooking pot hanging over the blazing campfire, two unowned bedrolls next to the fire and a barrel of food with a lantern on top beside them. There is a wooden platform behind the fire, with a third unowned bedroll under a lean-to and a square wooden table and chair beside it. On the table is a copy of the Speech skill book A Dance in Fire, v7 and Medresi's notes, a journal that foreshadows the quest awaiting inside the ruins. The entrance leads directly into a narrow passage descending to the southwest. As you begin to explore you will overhear Medresi Dran complaining, presumably about a mining crew she was to hire, mentioned in her journal, being cowards. You will encounter her at the top of some wooden scaffolding with ramps leading down to a wider passage. She will initiate a conversation with you, offering to split the treasure with you in return for clearing out the undead infesting the place. She carries a key that is required to completely explore the ruins and reach the 'treasure'. Although it can be pickpocketed with a high enough skill, this can lead to difficulties (see bugs). There are numerous burial urns and urns found throughout the ruins. From the bottom of the scaffolding, follow the passage as it takes a couple of turns, before eventually leading to a room containing a broken sarcophagus and many large urns, most of which are broken. A door in the southern corner leads directly into the main chamber, where three leveled draugr roam, including a magic-user. There are raised platforms on either side as you enter the chamber and broken masonry and furniture all around the room. The only item of worth in this room is a single burial urn behind the first pillar on the left. There are three further exits from the room; a gate in the middle of the southwest wall that leads to your ultimate goal, a broken walkway on the southwest side leading up to a balcony and an iron door to Angarvunde Catacombs and opposite, on the northwest side a passage with stairs leading up to an iron door to Angarvunde Ruins. On the raised sections at the rear are passages blocked by spears and windows looking through to shortcut exits from each of the side zones. Dispatching the three enemies in the first room will result in Medresi catching up with you and offering the key. The key opens the doors to both zones. Levers that can only be accessed by traversing each side zone must be activated, raising two gates to the southwest, giving access to the final chamber. You can explore the side zones in either order. She waits for you to clear out both side zones in front of the two gates to the southwest. Each gate is operated by one of the levers at the end of each zone that allows access back into the main chamber. As soon as you use the second of these, Medresi rushes ahead and meets an untimely end. Her death is scripted - you can save her from the trap by sprinting to catch up and using Unrelenting Force dragon shout, but she dies anyway. You can then use the surroundings to reach her body and loot the few potions of minor healing and other items carried by her. Follow Medresi as she rushes forward. The trap she triggers is a circular section of the floor that rises and meets a section of stake-studded ceiling that lowers, killing her instantly. The chest she was rushing towards is wide open and contains a small coin purse and the broken steel sword handle. The section of floor stays in the raised position, but you can use some fallen masonry to loot her corpse. Once that's done, inside the raised section is a flight of spiral stone stairs leading down to the true treasure room, containing the word wall, which teaches a word for the Animal Allegiance dragon shout. In front of the wall is an unlocked boss-level chest and a random enchanted weapon. When you're done, backtrack to the entrance, as there isn't a shortcut. Through the door are stairs descending to a short wide passageway with a cave-in at either end and a narrower passage with a large urn in front, leading off to the southeast. This turns southwest and enters a cave containing a dead draugr with a banded iron shield by the top of a stairwell in the middle of the room, with spiral wooden stairs leading down. Below you can hear another draugr patrolling. The stairs stop a short distance above the ground requiring you to drop and find an alternative route back out. Followers may refuse to accompany you, although they will be waiting by the spears in the main chamber. Once you drop down, you will be faced with a leveled draugr who is patrolling up and down more stairs to the northwest. The room under the stairwell contains little of value except a burial urn by a damaged throne. At the bottom of the stairs is a second leveled draugr, who is likely to be alerted to any fighting with the first. You are actually on the other side of one of the cave-ins passed in the wider passage previously. The passage continues to the northeast, passing a flight of stairs on the left with an apprentice level trapped chest at the top, and another cave-in behind. Opening the chest without disarming the trap will trigger poison darts to shoot from the side walls in front of the chest. The passage turns a short distance after the stairs and passes a set of shelves holding a burial urn and some ruined books. A magic-using draugr patrols this section of passageway. After another turn you can see the start of catacombs ahead and a leveled draugr slumbering in an upright alcove. There is also another leveled draugr patrolling just out of sight, who is likely to be alerted to any fighting. In an alcove to the right of the first draugr is a burial urn with three loose septims on the ground in front. Around the corner stairs descend to the northwest. At the bottom you'll find another draugr in an alcove on the right. Opposite is a broken sideboard with a burial urn in front. The passage continues through to the next area and another draugr, in an alcove behind a novice-locked chest on your left. Take care as opposite this alcove is a doorway into a room where another leveled draugr is patrolling. To the right of the doorway is an alcove containing a random healing, magicka or stamina potion. The next room contains four huge canis roots, one in each corner, an unlocked chest behind a broken pillar, and a corundum ore vein on the southeast wall. The exit is to the northwest and leads back into catacombs. Opposite is an alcove containing a random potion healing, magicka or stamina potion. There are stairs leading up to the northeast, with a pressure plate partway up that triggers poison darts from the floor. There is a burial urn by a turn with more stairs, and another pressure plate and more poison darts from the floor. They can be used to your advantage, as the room at the top contains three leveled draugr, which at higher levels can all be deathlords and present a challenging fight. The room is full of vegetation, but holds nothing of interest, and climbs to the rear, before stairs lead up to wider catacombs with horizontal alcoves along both sides. 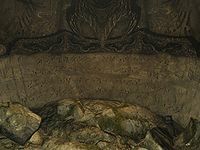 Some of the alcoves hold dead draugr that can be looted for random armor or minor loot, some hold burial urns, and some hold slumbering draugr. Around the first corner, an alcove on the left above one of the slumbering draugr contains an empty petty soul gem. Work your way through these catacombs, dealing with the draugr as you go, until you reach an iron door at the top. There is a sideboard on the left, with a copy of Wraith's Wedding Dowry, a random dagger and a random potion of stamina on top. The door leads back to Angarvunde, to the room behind the spears and seen through the window containing two whole large urns, an unlocked chest and a lever that both lowers the spears allowing access back to the main chamber and also raises one of the gates to the final chamber to the southwest. Through the door is a narrow passage that takes several turns, descending flights of stairs before you reach the first of several pressure plates in the floor, each of which triggers a row of swinging blades to swing once in each direction. The passage leads to a room containing a draugr. There is a stone table in the middle of the room with a copy of the Illusion skill book Before the Ages of Man and a burial urn on top and behind the table, against the wall is a novice-locked chest. There are two sets of spears blocking two passages from this room to the northeast and southwest, an iron door in the northeast to the right of the blocked passage and a doorway to the northwest. Behind the door is a cave-in with two burial urns among the rubble. To the northwest is a short passage leading to a split-leveled room with a leveled draugr on a walkway opposite from where you enter. There are wooden stairs leading down in front of you to the lower level of the room. At the bottom of the room is another leveled draugr patrolling in and out of a passage to the southwest. Staying on the upper level and following it around to the right leads to the walkway the first draugr stands on. This crosses first to a pillar, and then originally to a balcony on the far side of the room, but part of the walkway has collapsed; the balcony can easily be reached by jumping, however. On the balcony is a pedestal with a leveled poison on a weight sensitive plate that triggers spears to shoot from above and front of you; to avoid damage, stand to the side, use telekinesis, or knock it off with a ranged spell or weapon. If the poison is accidentally knocked off, it can be difficult to find, due to the lower level being filled with vegetation, but there is nothing else of interest in the lower level. Through the doorway to the southwest is a wide flight of stairs with a magic-using draugr patrolling backwards and forwards along the passage at the top. This passage takes a couple of turns before climbing a flight of stairs up to a room behind one of the sets of spears blocking access in the first room of this area. There is a lever opposite, between two sets of spears. The lever lowers both sets here and the other set on the far side of the room. Behind the set on the left is a novice-locked chest, while the second set gives access back to the first room, and the third set gives access to the passage to the northeast. On your right when passing back into the first room of this area is a large urn. Beyond the spears to the northeast are three burial urns by a flight of stairs leading down. The passage turns back on itself and then turns again before opening into a wider passage. On your left is a cave-in, while to the right is an urn and a set of shelves, holding only clutter. Once past the shelves, the passage turns again and you'll encounter a draugr patrolling the next section. By the corner is a pressure plate that triggers a battering ram, which can be used to your advantage. At the far end the passage staggers to the right, where a leveled draugr is lurking just out of sight. This draugr is normally alerted to fighting the previous draugr. At the end is another cave-in and a doorway into a large chamber with two levels of walkways above. On the lower of these is a draugr magic-user. There are two upright sarcophagi against the left-hand wall. Upon entering both the sarcophagi will burst open and leveled draugr will emerge. There is a sideboard between the sarcophagi holding two random potions of either healing, magicka or stamina, a random potion and a dagger. In the southeastern corner is a burial urn, an urn and an unlocked chest, while against the northeast wall wooden stairs lead up to a balcony and the first walkway. This crosses the room before a series of stairs lead up to the higher walkway. This leads across to a room containing a set of shelves holding a random helmet, a large coin purse, and two random potions of healing, magicka or stamina. There are also three burial urns in the room and stairs descending to the southeast. At the bottom is a wide passage with several opened sarcophagi lining the walls patrolled by a leveled draugr. At the other end, around the corner to the right, are several statues with a random two-handed weapon, a medium coin purse, a ruby, and nineteen loose septims in front of them. To the left of the statues are stairs leading up to the southwest. At the top by a lit brazier is one last burial urn, and on the left is an iron door. The door leads back to Angarvunde, like the catacombs, to the room behind the spears. The room contains a broken sideboard with another two random potions of healing, magicka, or stamina, and two burial urns. Continuing into the room, you will find a large urn, an unlocked chest, and the lever that lowers the two sets of spears granting access back into the main chamber and raises one of the gates to the southwest. A room in Angarvunde Catacombs contains four giant canis roots. Most canis roots are roughly one foot tall, while these four are the size of trees and taller than you. Angarvunde is marked as cleared when the related quest is completed. Therefore, clearing this location is not triggered by killing its boss enemy (unlike all other dungeons in the game), but rather by discovering the word wall. This issue has been addressed by version 1.3.2 of the Unofficial Skyrim Patch; it adds a draugr boss near the word wall with the scripts to mark Angarvunde cleared. There is a silver ore vein a short distance southeast of the camp. 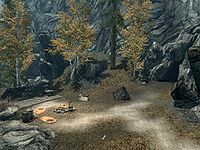 There is a small storage area with a strongbox, lockpicks, and potions farther up the side of the mountain to the south-southeast of the camp. You can also kill Medresi as soon as you enter, which will still allow you to progress the miscellaneous objective. Clearing this location does not increment the number of "Dungeons Cleared" displayed in your journal, and therefore does not contribute to the Delver achievement. If you pickpocket the key from Medresi instead of talking to her, she can get stuck: you can open the gates, but Medresi will refuse to go through them. In this case, you must kill her to progress. When chasing Medresi into the last room, the floor trap might open, immediately close again, and then remain closed, so the final room with the word wall cannot be accessed. If you retreat to the main chamber and re-enter the final room a second time the floor trap may open for you. In the Angarvunde Catacombs, past the canis root and when you get to the resting draugr, the sound effect for the stone steps in that area seems to be the sound effect for wooden steps. ?